Your beach wedding invitations is the the perfect excuse to break away from tradition with your invitation style and even your wording. Have fun! But if you prefer something a little more traditional that is also fine. Just remember that your wedding invitations should reflect at least a little of your theme. There are many sources of interesting and unique styles of wedding stationary. You may know of a local printer who can do exactly what you are looking for, or you can find good stationers or specialist wedding stationary companies in the Yellow Pages or local papers or of course. 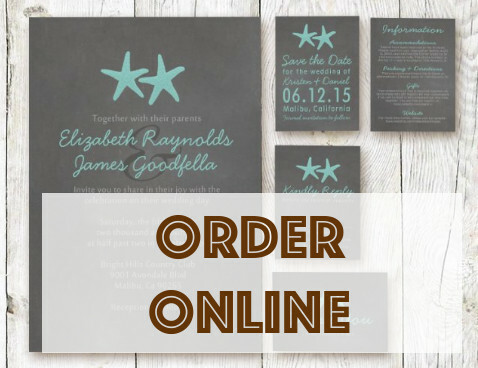 Or even easier, choose your perfect beach wedding invitations online. Click here for some links to beautiful online beach wedding invitations. If you have a strict budget and you have the time on your hands (or a few friends and family members who are willing to help) you may want to consider making your own invitations. While it is much easier to just order everything in, hand made invitations will get the same job done, and will be a lot more personal. 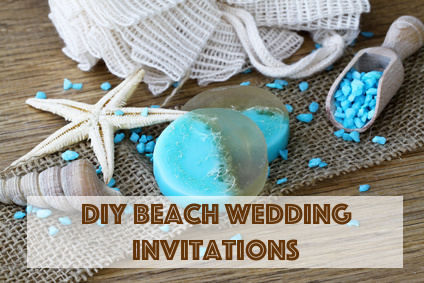 Click here for a few ideas on making your own beach wedding invitations. The wording for your invitations is another thing to consider and decide upon. These days there are so many different options for the wording that it can be quite a worry to make sure you follow the right style. For a few ideas and tips on your invitation wording click here. 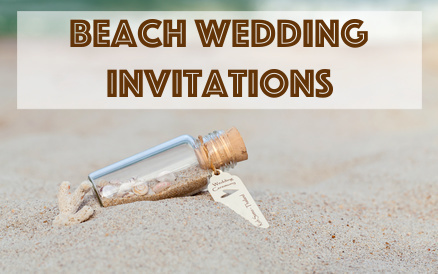 Make sure you state on the invitations that all or a part of the wedding celebrations will take place on the beach so your guests can dress appropriately. Ladies can remember to bring some flip flops or dress in flats instead of heels. Gents can also remember to dress in appropriate shoes. Do send a map with the invitation. This may seem obvious, but it is important that people know where they are going! This is relevant for both the ceremony AND the reception venues. Consider setting up a booking service for your guests. This is an ideal job to give a relative desperate to help with the wedding plans. Put a small card in with the main invitation saying: "Please call Tanya Smith for hotel and B&B accommodation on..." Also include a list of accommodation options with price ranges to suit all budgets. Also remember to include a response card and a self-addressed return envelope. It may also be helpful to ask any guests with special dietary needs to note that on your response card. If you will not be doing number 4 above here, then leave guests with your email address where they can RSVP to. Consider creating an "our wedding" group on Facebook where you can keep everybody up to date with news, changes etc. Find out why and how here. And/or create a free wedding website where your guests can access all the details about the wedding even if they lose the original invite. You can do a simple search on the web or try The Knot's free one here. Include the details to these resources in your beach wedding invitations. If you are doing a bit of a wedding weekend with events and things happening before and after the wedding, you may want to mention this in an include (perhaps combine this info with the details of your Facebook Wedding Group or Wedding Website) so that guest can plan to take more time off than just one or two days. This will also encourage them to make use of the Facebook Group or Wedding Site to keep up to date with these events as details may not yet be available at the time you send out your invites.